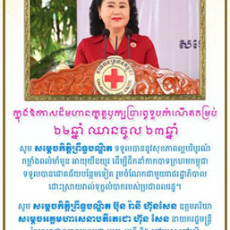 សេចក្ដីជូនដំណឹង ពីលទ្ធផលពិភាក្សាការងាររវាងឯកឧត្ដមបណ្ឌិតរដ្ឋមន្ត្រី និងរដ្ឋមន្ត្រីក្រសួងការងារថៃ ឯកឧត្ដមឧត្តមសេនីយ៍ Po. Gen. ADUL SANGSINGKEO. Copyright © by 2012 - 2019 Ministry of Labour and Vocational Training. Designed & Hosting by KWIN Inc.